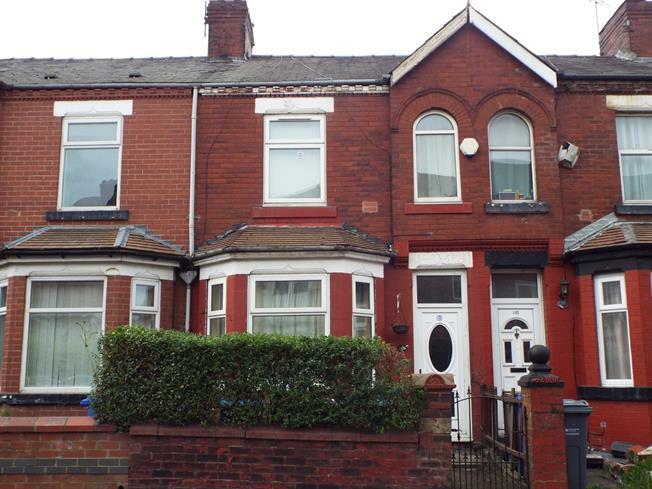 This mid terraced property offers excellent family accommodation and is close to the local schools the markets on Conran Street and with easy access to Manchester city centre. Comprising of a hallway, two reception rooms and a extended fitted kitchen, two double size bedrooms with a added dresser to the second bedroom and a fabulous four piece bathroom. The loft has been converted and may offer a simple project subject to planning for a third another bedroom. This property also benefits from a caller with one chamber. Good value. UPVC front double glazed door. Radiator, original coving, ceiling light. Double glazed uPVC bay window facing the rear overlooking the garden. Radiator, carpeted flooring, ceiling light. UPVC side double glazed door, opening onto the garden. Double glazed uPVC window facing the rear and side. Vinyl flooring, textured ceiling, ceiling light. Roll edge work surface, fitted and wall and base units, one and a half bowl sink and with mixer tap, integrated, electric oven, integrated, electric hob, overhead extractor, space for standard dishwasher, space for fridge/freezer. Double glazed uPVC window with obscure glass facing the rear. Radiator, vinyl flooring, textured ceiling, ceiling light. Low level WC, roll top bath, single enclosure shower, pedestal sink, extractor fan.